This moist chicken is bursting with flavour. Friends and family alike will be sure to request a repeat performance after sampling this irresistible barbecued chicken! Empty seasoning mix into pie plate. Add chicken, 1 piece at a time; turn to evenly coat. Grill chicken 3 min. on each side. 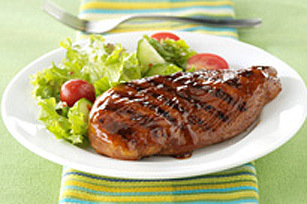 Brush with barbecue sauce; grill 2 min. on each side or until done (170ºF). Set the timer in the kitchen for 3 min. on each side so you don't forget to turn the chicken. Take care to not overcook the chicken -- grill just until the juices run clear.